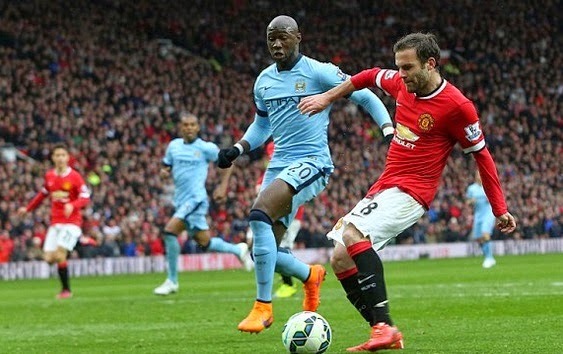 In what was a very important Manchester derby in the race for the top 4 finish, Manchester United hosted arch rivals Manchester City at old trafford in the afternoon of Sunday, 12 April 2015 knowing a win in this game will put them firmly in great position to finish the season in top 2 or atleast 3 and confirm their Champions League status next season. United started the game on the back foot and City took advantage when an early goal from Sergio Aguero stunned the home support in just the 8th minute of the match and it looked like United are going to have trouble coping with City pace upfront. However minutes later Ashley Young found himself in massive space and he used his pace to score first of United and brought them level on terms. Marouane Fellaini has turned things around as far his career is concerned with United and he showed how important he has been for Van Gaal when he scored United’s second with a thumping tradmark header to make it 2-1 for home side. After the break inform Juan Mata scored United third and put the game to bed and secured all three points for United with a good finish. United were not done yet as Chris Smalling put fourth past City to complete a rout which will certainly send message to Arsenal and Chelsea who are above United in the league. Where City will go from here ? well now they find themselves fighting to keep their place in the top 4 as Liverpool can reduce the gap with a win on monday.